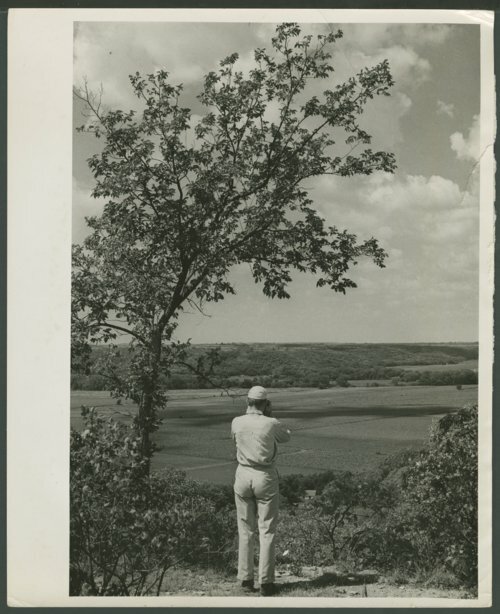 Philip Meyer took a series of photographs showing residents of the Blue River Valley as they prepared to move from their homes and farms as part of the Tuttle Creek reservoir and dam relocation project. He captioned this photograph: "Climbing the hill above his father's house to photograph the valley was the first mission of the young physician [Dr. Reuben Burkman] as he began his final tour. The valley is 2 miles wide at this point."